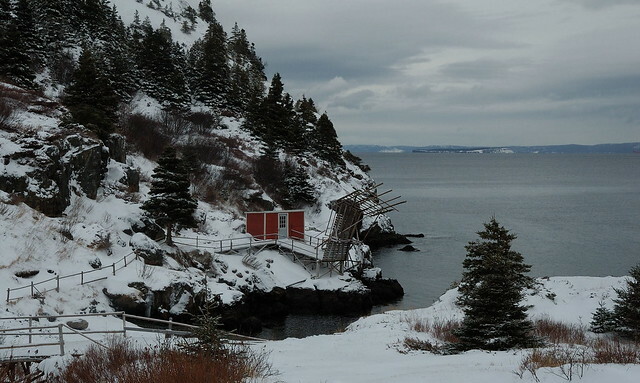 After Avondale, we mosied along to Conception Harbour. 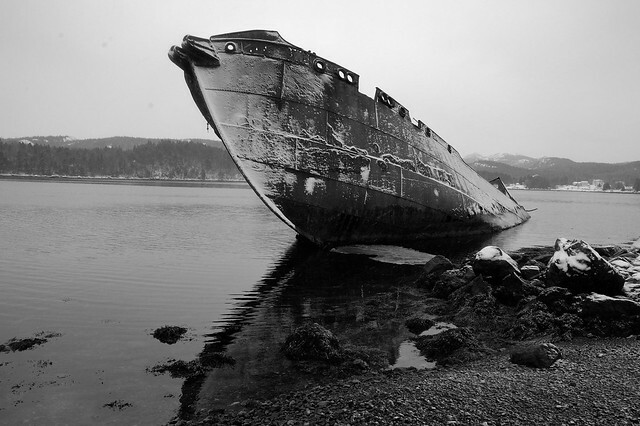 There’s a wreck there of a whaling ship, thought to be the “SS Sposa” that has been beached there since 1964 and it makes for dramatic photos. 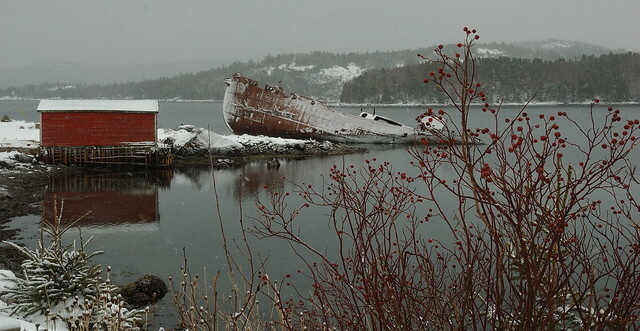 Apparently the SS Southern Foam and SS Charcot lie out in the harbour and make for excellent scuba destinations. For more information on these whaling ships, have a gawk at this article by Dennis Flynn. The wreck itself is quite dramatic and its orientation lends itself to fairly powerful (i.e. vertical) shots, when approached from a certain angle. It snowed the whole time I was taking these, which proved to be an additional challenge, not because I was concerned with the flakes that show up in the shots, but rather that I didn’t want water blobs from the melted snow on my lens. I had to aim my shots so as to avoid shooting “into the snow”. 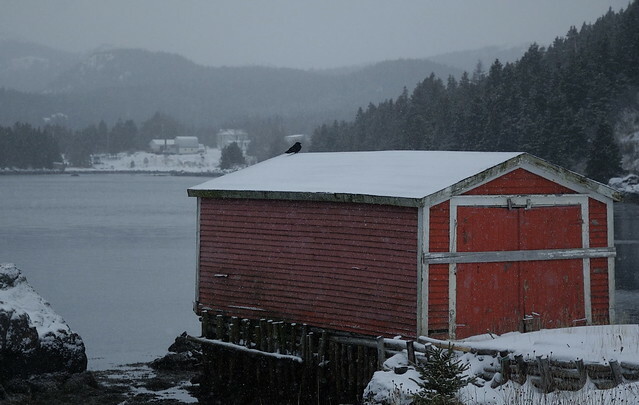 The picture of the red shed below was snapped as I first approached the beach. I saw just the one crow on the roof, but about three steps forward, after this shot was take, a positive murder of them exploded off the shore. They, being black, were almost invisible against the dark rocks in the dull light. I really enjoyed working in black and white for this shot. 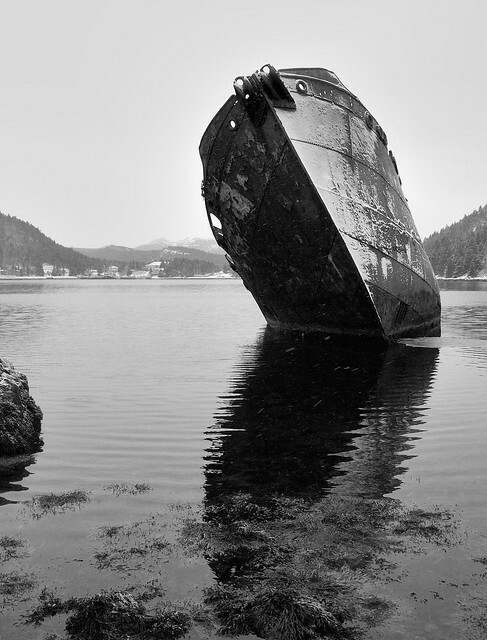 The lines of the ship and the reflections stand out so much more vividly when colour is removed. There’s another good shipwreck (possibly the ill-fated pig carrier?) for scuba enthusiasts just off shore, from what I hear. 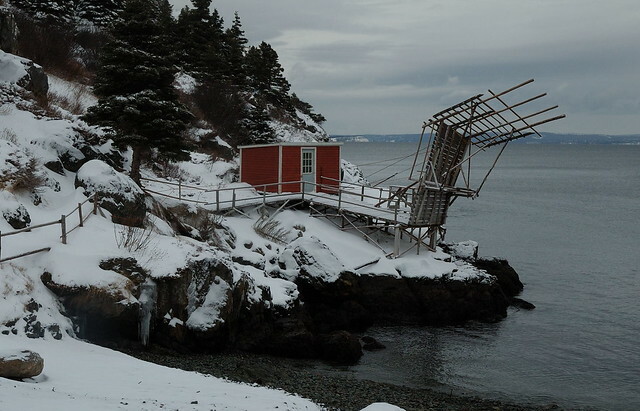 At any rate, we popped down to this cove to hunt for a geocache and found this rather odd cabin/hut/stage in the process. Having lost wharves to the ice ourselves, we were, in fact, rather impressed. It looks relatively new, so I wonder how it will hold up over time. Previous Post Avondale Station, everybody out! Next Post Cupids. Not Brigus. Oops. I adore this set — the colors, the lighting and the starkness of the winter landscape. Lovely. Here you go! Although recent research has revealed that this is not the Sposa, but another ship.